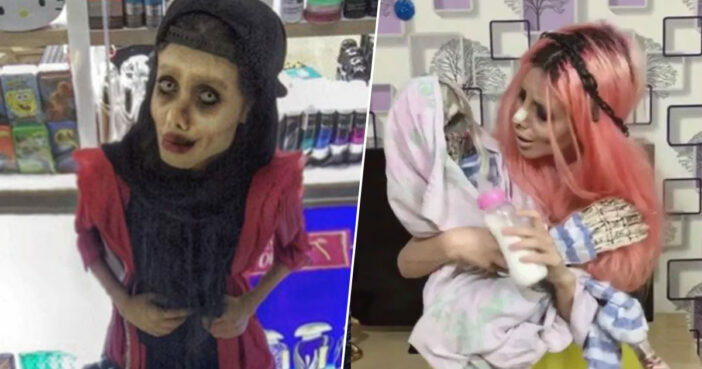 Self professed Angelina Jolie ‘lookalike’ Sahar Tabar is back, and has somehow managed to bring further creepiness to her, erm, unique sense of style. 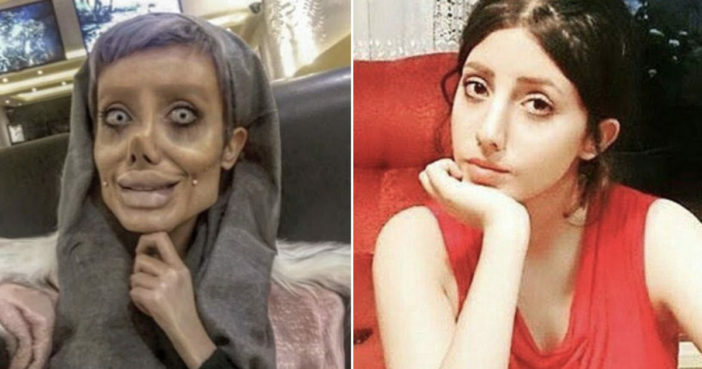 The Iranian teenager – who once claimed to have undergone numerous plastic surgeries to achieve her dream of emulating the Hollywood megastar – has posted a disturbing clip on Instagram with the caption, ‘Mommy be mine’. In the clip, Sahar can be seen rocking a swaddled ‘demon baby’ in her arms, feeding it with a bottle and singing to it in a sinister, off-key way. The clip culminates with a pink-haired Sahar kissing the ‘baby’ on its skeletal cheek before letting out a series of high pitched shrieks. Sahar’s fans are well used to her producing eerie content to spark reaction, but many were still pretty grossed out by this latest horror post, even if it was photoshopped. Omfg just stop with the videos they ain’t cute they’re disturbing. Ok now I am freaked out. Sahar first rose to public prominence after posting gruesome pictures of herself online which showed her face looking gaunt and grey, all while claiming she has had ’50 plastic surgeries’ to look like Oscar winning Jolie. She later admitted the zombie-like pictures had been photoshopped as part of a stunt. Although Sahar has gone under the knife on multiple occasions, the number of surgeries was nowhere near the 50 she initially claimed to have had. Sahar also confessed to having exaggerated her tales of a dramatic weight loss, having lost just ‘five or seven’ kilos rather than ’40 or 30 kilos’ as she’d originally claimed. This is photoshop and makeup. Every time I publish a photo, I paint my face in an increasingly funny way. It is a way of expressing yourself, a kind of art. My fans know that this is not my real face. For me the most important thing in life is the approval of my family and God. This approval is enough for me. The opinion of other people does not bother me at all. I release negative opinions.